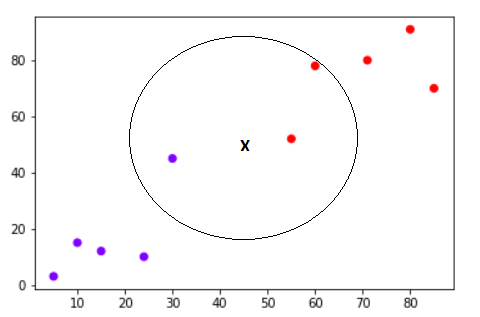 The K-nearest neighbors (KNN) algorithm is a type of supervised machine learning algorithms. KNN is extremely easy to implement in its most basic form, and yet performs quite complex classification tasks. It is a lazy learning algorithm since it doesn't have a specialized training phase. Rather, it uses all of the data for training while classifying a new data point or instance. KNN is a non-parametric learning algorithm, which means that it doesn't assume anything about the underlying data. This is an extremely useful feature since most of the real world data doesn't really follow any theoretical assumption e.g. linear-separability, uniform distribution, etc. The intuition behind the KNN algorithm is one of the simplest of all the supervised machine learning algorithms. It simply calculates the distance of a new data point to all other training data points. The distance can be of any type e.g Euclidean or Manhattan etc. It then selects the K-nearest data points, where K can be any integer. Finally it assigns the data point to the class to which the majority of the K data points belong. Let's see this algorithm in action with the help of a simple example. Suppose you have a dataset with two variables, which when plotted, looks like the one in the following figure. Your task is to classify a new data point with 'X' into "Blue" class or "Red" class. The coordinate values of the data point are x=45 and y=50. Suppose the value of K is 3. The KNN algorithm starts by calculating the distance of point X from all the points. It then finds the 3 nearest points with least distance to point X. This is shown in the figure below. The three nearest points have been encircled. 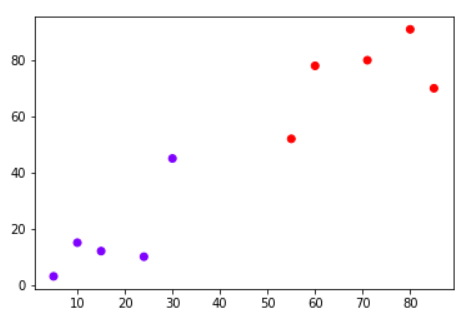 The final step of the KNN algorithm is to assign new point to the class to which majority of the three nearest points belong. From the figure above we can see that the two of the three nearest points belong to the class "Red" while one belongs to the class "Blue". Therefore the new data point will be classified as "Red". In this section we'll present some of the pros and cons of using the KNN algorithm. As said earlier, it is lazy learning algorithm and therefore requires no training prior to making real time predictions. This makes the KNN algorithm much faster than other algorithms that require training e.g SVM, linear regression, etc. Since the algorithm requires no training before making predictions, new data can be added seamlessly. The KNN algorithm doesn't work well with high dimensional data because with large number of dimensions, it becomes difficult for the algorithm to calculate distance in each dimension. The KNN algorithm has a high prediction cost for large datasets. This is because in large datasets the cost of calculating distance between new point and each existing point becomes higher. Finally, the KNN algorithm doesn't work well with categorical features since it is difficult to find the distance between dimensions with categorical features. In this section, we will see how Python's Scikit-Learn library can be used to implement the KNN algorithm in less than 20 lines of code. The download and installation instructions for Scikit learn library are available at here. Note: The code provided in this tutorial has been executed and tested with Python Jupyter notebook. We are going to use the famous iris data set for our KNN example. The dataset consists of four attributes: sepal-width, sepal-length, petal-width and petal-length. These are the attributes of specific types of iris plant. The task is to predict the class to which these plants belong. There are three classes in the dataset: Iris-setosa, Iris-versicolor and Iris-virginica. Further details of the dataset are available here. The X variable contains the first four columns of the dataset (i.e. attributes) while y contains the labels. To avoid over-fitting, we will divide our dataset into training and test splits, which gives us a better idea as to how our algorithm performed during the testing phase. This way our algorithm is tested on un-seen data, as it would be in a production application. The above script splits the dataset into 80% train data and 20% test data. This means that out of total 150 records, the training set will contain 120 records and the test set contains 30 of those records. The gradient descent algorithm (which is used in neural network training and other machine learning algorithms) also converges faster with normalized features. It is extremely straight forward to train the KNN algorithm and make predictions with it, especially when using Scikit-Learn. The first step is to import the KNeighborsClassifier class from the sklearn.neighbors library. In the second line, this class is initialized with one parameter, i.e. n_neigbours. This is basically the value for the K. There is no ideal value for K and it is selected after testing and evaluation, however to start out, 5 seems to be the most commonly used value for KNN algorithm. The results show that our KNN algorithm was able to classify all the 30 records in the test set with 100% accuracy, which is excellent. Although the algorithm performed very well with this dataset, don't expect the same results with all applications. As noted earlier, KNN doesn't always perform as well with high-dimensionality or categorical features. In the training and prediction section we said that there is no way to know beforehand which value of K that yields the best results in the first go. We randomly chose 5 as the K value and it just happen to result in 100% accuracy. 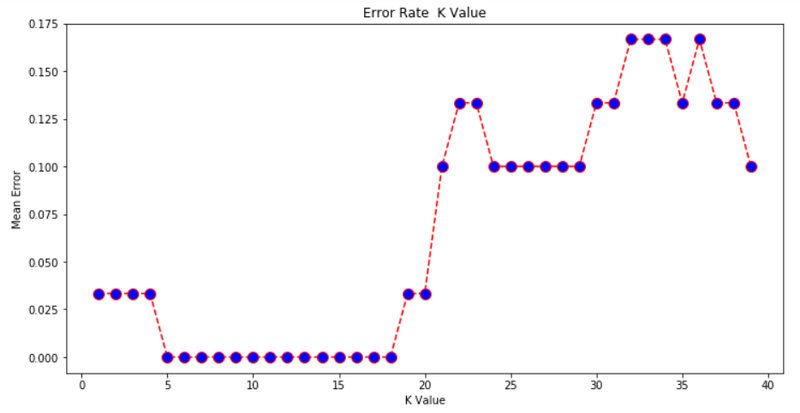 One way to help you find the best value of K is to plot the graph of K value and the corresponding error rate for the dataset. In this section, we will plot the mean error for the predicted values of test set for all the K values between 1 and 40. The above script executes a loop from 1 to 40. In each iteration the mean error for predicted values of test set is calculated and the result is appended to the error list. From the output we can see that the mean error is zero when the value of the K is between 5 and 18. I would advise you to play around with the value of K to see how it impacts the accuracy of the predictions. While reading blog posts like this is a great start, most people typically learn better with the visuals, resources, and explanations from courses like those linked above. KNN is a simple yet powerful classification algorithm. It requires no training for making predictions, which is typically one of the most difficult parts of a machine learning algorithm. The KNN algorithm have been widely used to find document similarity and pattern recognition. It has also been employed for developing recommender systems and for dimensionality reduction and pre-processing steps for computer vision, particularly face recognition tasks. From here, I would advise you to implement the KNN algorithm for a different classification dataset. Vary the test and training size along with the K value to see how your results differ and how can you improve the accuracy of your algorithm. A good collection of classification datasets is available here for you to play with. What other applications have you applied the KNN algorithm to? How did it work out for you? Let us know in the comments!